Pop some corn, relax, and watch the classic 1955 film KISS ME DEADLY. 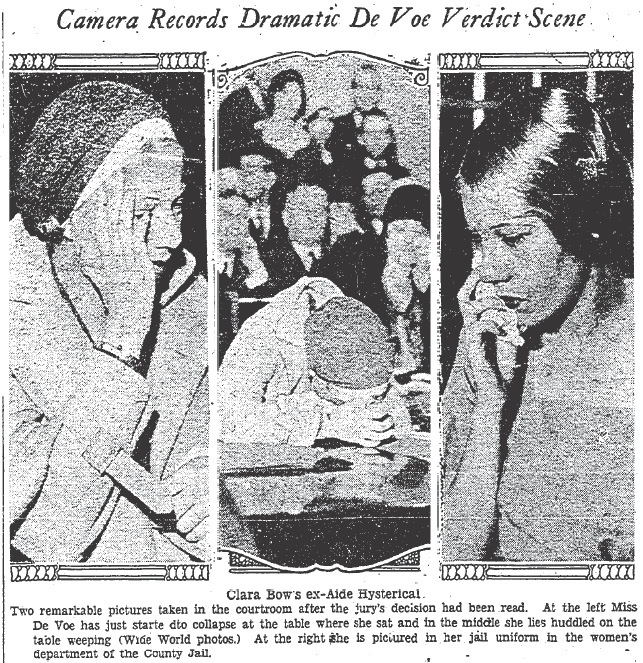 On October 29, 1941, a story appeared in the L.A. Times about a man, Monty J. llingworth, who had been arrested for the 1937 murder of his wife, Hallie, in Clallam County, Washington. Because Illingworth had committed the crime in Washington it wasn’t covered extensively here, but I have to wonder if Raymond Chandler saw the piece in the newspaper and was inspired to write THE LADY IN THE LAKE (published in 1943). 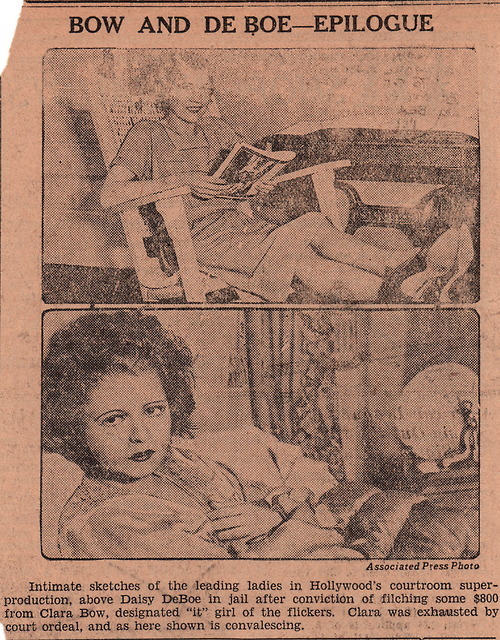 The true story of the Lady began on July 6, 1940 when two fishermen found the well preserved body of a woman floating in the waters of Lake Crescent, near Port Angeles, Washington. The corpse had been wrapped in blankets and tied with heavy rope. There was a chemical reason for the relatively good condition of the woman’s body, she had saponified, she had literally turned into soap! 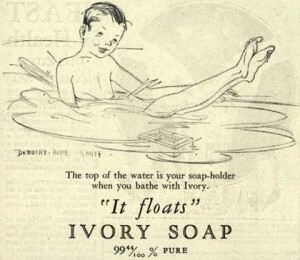 In fact, she had become very much like Ivory soap, the “soap that floats”. Even though they were unable to I.D. the woman her cause of death was certain, she had been strangled. The press dubbed the unknown woman The Lady of the Lake. She was buried as a Jane Doe in a pauper’s grave. She was exhumed a couple of times in an attempt to give her a name, but it wasn’t until criminologist Hollis B. Fultz began to look at missing persons reports from the area that the case came together. Hollis focused his attention on a missing waitress, Hallie Illingworth. Hallie had been an attractive woman with auburn hair — the corpse also had auburn hair. Hallie was married to a beer truck driver, Monty Illingworth, at the time of her disappearance. Monty told people that Hallie had run off with a Navy lieutenant commander. Further investigation revealed that Hallie had never contacted any of her family, which the cops found suspicious. Also suspicious was the fact that Monty had filed for a divorce five months after she’d vanished on the grounds of incompatibility, not desertion. A chart was made of the dead woman’s unique upper dental plate and advertised in professional journals. Finally a dentist from South Dakota came forward to positively identify The Lady of the Lake as Hallie Illingworth. Monty had moved to Long Beach, California shortly after Hallie allegedly ran off with a Navy man. Monty wasn’t alone, accompanying him was Elinore Pearson the daughter of a wealthy timber magnate. The couple had been living as husband and wife yet Elinor was coy when asked if she was married to Monty, she would neither confirm nor deny it. 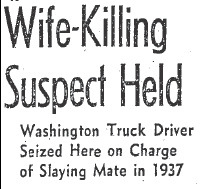 The truck driver was extradited to Washington where he was tried for Hallie’s murder. 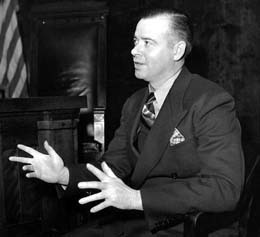 On March 5, 1942 a Washington jury found Monty Illingworth guilty of second degree murder. They’d agreed on the lesser charge because they felt the crime had been one of passion and not premeditation. 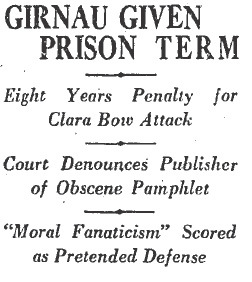 Monty was sentenced to life in Walla Walla Prison, but was paroled after only nine years. 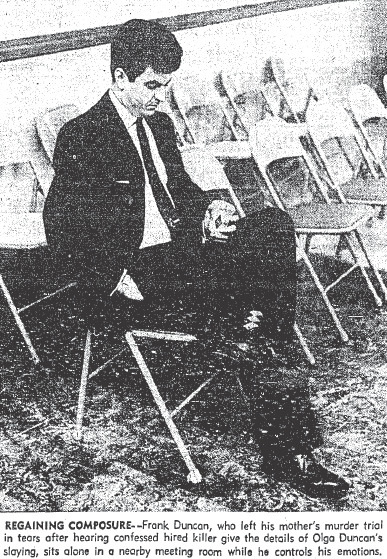 He returned to California where he lived until his death in the early 1960s. 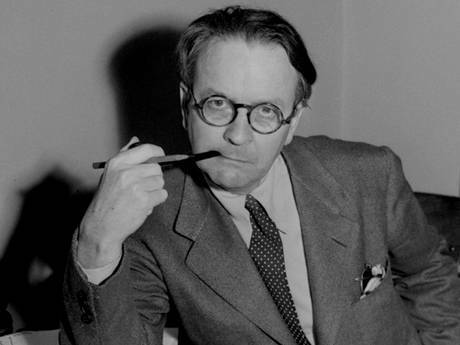 A writer of Chandler’s caliber wouldn’t have needed anything more than a small newspaper piece to become inspired. 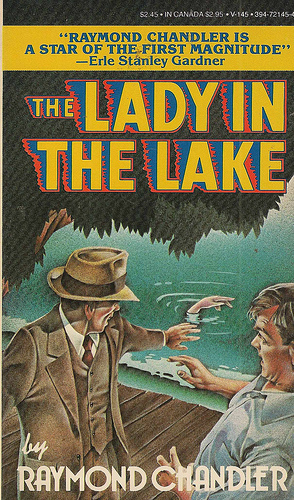 Of course I don’t know if Raymond Chandler actually saw the story about the Lady of the Lake, but I like to think so. Elizabeth Duncan’s plea of not guilty by reason of insanity would ultimately fail. She was interviewed by shrinks and she even submitted to a brain wave test, but nothing about her tests indicated that she was insane. 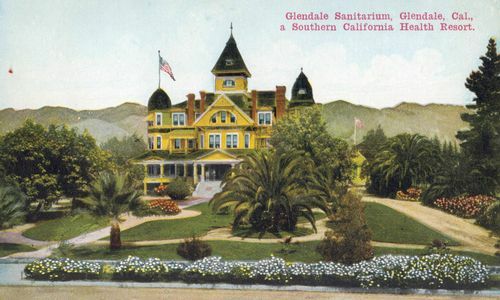 Dr. Louis R. Nash, assistant director of Camarillo State Hopsital, described Elizabeth Duncan as a “psychopathic personality” and a “pathological liar”, but said that she sane. 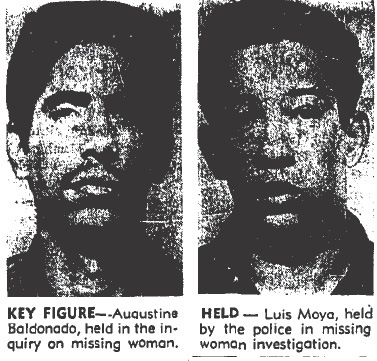 On January 30, 1959, Luis Moya withdrew his not guilty plea and entered a plea of not guilty by reason of insanity. Gus Baldonado would quickly do the same. And, just like Ma, they would be found sane. The jury of eight women and four men was finally seated. They must have felt their responsibility acutely, it was, after all, a death penalty case and they were charged with determining Ma’s guilt or innocence. There was bad news for Ma, three of them had admitted to believing her guilty before hearing a word of testimony! 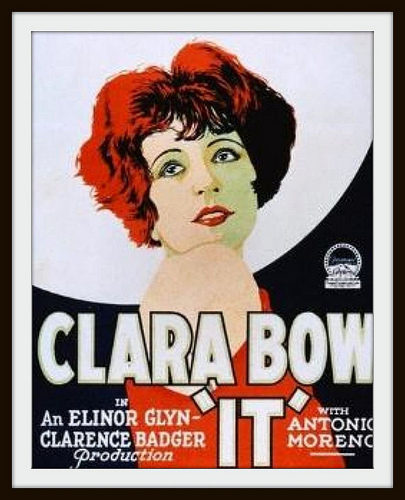 When Ma got the news that the jurors had been selected she was asked if she thought she could get a fair trial. She didn’t think so, she said that there were too many people against her. The trial testimony was as gut wrenching as the grand jury testimony had been. In particular, Luis Moya seemed to want to talk. 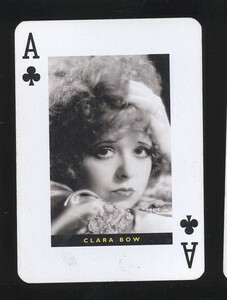 Moya said that he and Baldonando had been introduced to Mrs. Duncan through Mrs. Esperanza Esquivel, the operator of the Tropical Cafe in Santa Barbara. Equivel would act as the go-between. The plan Moya and Baldonado came up with was to kidnap Olga and take some of her clothes to make it appear she’d gone on vacation. They were going to dispose of her near Tijuana. Ma pawned a ring to give Moya $175 for expenses. She said ‘Sure, I’ll help you bring him up.’ When she opened the door of the car I hit her a blow over the head with the pistol to try to knock her out. Moya said he drove down to the Cabrillo Highway near the beach. Olga was still screaming and Baldonado was hitting her with the pistol. “I stopped the car and told Baldonado to give me the pistol. I hit her a heavy blow on the head and she passed out. Baldonado taped her hands. The car they’d rented from a friend for $25 wasn’t working well. They stopped twice before selecting Olga’s final resting place. Baldanodo wasn’t nearly as loquacious as Moya — his testimony provided some corroboration but primarily consisted of “I don’t recall” answers. At last Ma took the stand. She testified that she had once plotted to tie up and kidnap Frank! She felt that if she got him away from Olga he’d snap to his senses; however, she continued to deny that she threatened Olga or ever intended to harm her. 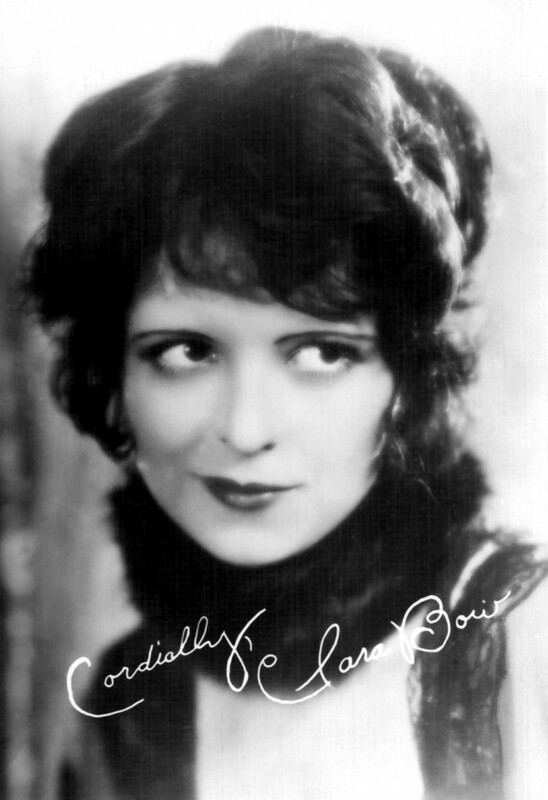 The courtroom was thrown into an uproar when Ma’s past was exposed during cross-examination by the D.A.. She had been married about 16 times, and had failed to get an annulment or divorce for many of them. The D.A. also revealed that she had six children! Ma acknowledged 10 of the marriages, but she said she couldn’t recall any of the others. When she was asked about her relationship with Frank, Ma said it was one of love and devotion. The D.A. asked if she loved Frank more that her other children, she replied: “Yes”. He continued to support Elizabeth’s story throughout the trial. While Ma’s personality was revealed during the trial, it was difficult to get a handle on Frank — what he knew, when he knew it, and exactly what kind of man he was. He was in law school when Ma was running a brothel and he must have known what was going on. How did he feel about that? He never said. 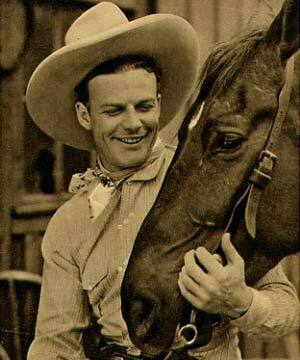 There were, however, a few tantalizing glimpses into Frank’s personality. He became angry and actually rose to object when the D.A. taunted him by calling him “Frankie”. He left the courtroom in tears during Luis Moya’s testimony in which he recounted the details of Olga’s monstrous death. 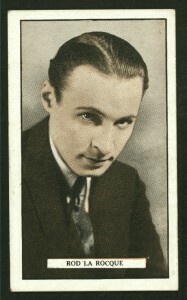 Frank admitted that he’d dated a woman in San Francisco during a business trip while he was married to Olga. He didn’t bother to tell his date that he was married. Apparently Frank couldn’t be faithful even for the six month duration of his marriage to Olga. What was even more surprising was that Frank married again, secretly, during Ma’s trial! If there was one person in the case that was a cipher, it was undoubtedly Frank. 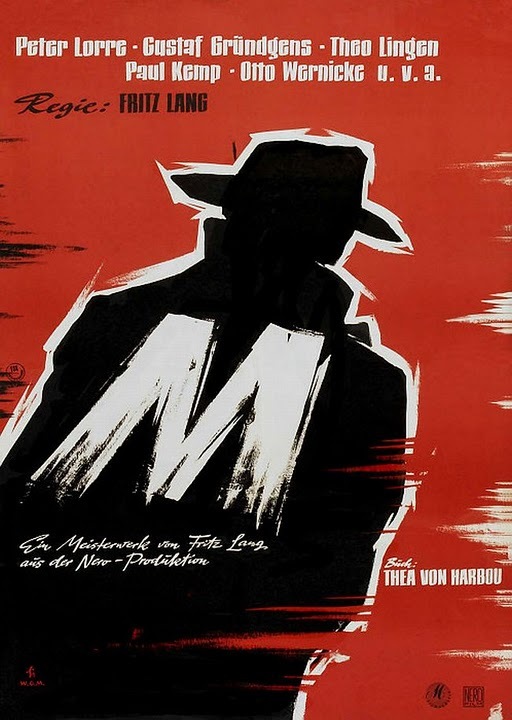 On March 16, 1959, after 4 hours and 51 minutes of deliberation, Ma was found guilty. Moya and Baldonado were found guilty at their trials as well. All three were given the death penalty. Frank fought for his mother until the end. In fact he wasn’t at her August 8, 1962 execution because he was in San Francisco at the Federal Court arguing her case. 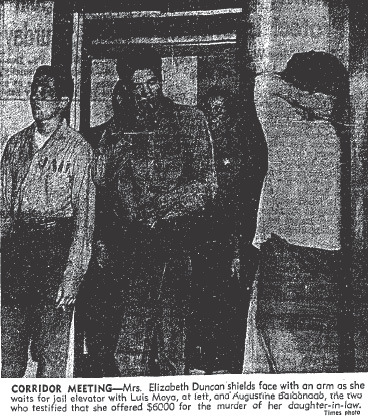 Elizabeth Duncan, Luis Moya, and Gus Baldanado were busted on December 19, 1958 for conspiracy to murder Olga Duncan. Bail was set at $100,000 each (the amount is equivalent to over $7 million 2013 USD). Two days later, on December 21st, the cops went public with an appeal to help them find Olga Duncan’s body. The public didn’t have to do a thing because Gus Baldanado confessed that same day and implicated Luis Moya and Elizabeth Duncan. He also led them to Olga’s body in Casitas Pass. Luis Moya would also confess to his part in the slaying. Ma, however, was adamant that she was not guilty. If Santa Claus had any presents for Frank Duncan he was going to have a tough time finding him because the attorney mysteriously vanished on Christmas Eve. District Attorney Roy Gustafson would have better luck with a subpoena requiring Frank to testify before the grand jury — Ma’s son was located in a Hollywood apartment. According to testimony during the grand jury hearing, Ma had approached at least four people with various plans to kill Olga. Mrs. Barbara Reed, a carhop at the Blue Onion Restauant in Santa Barbara, said she had been acquainted with Ma for at least ten years. 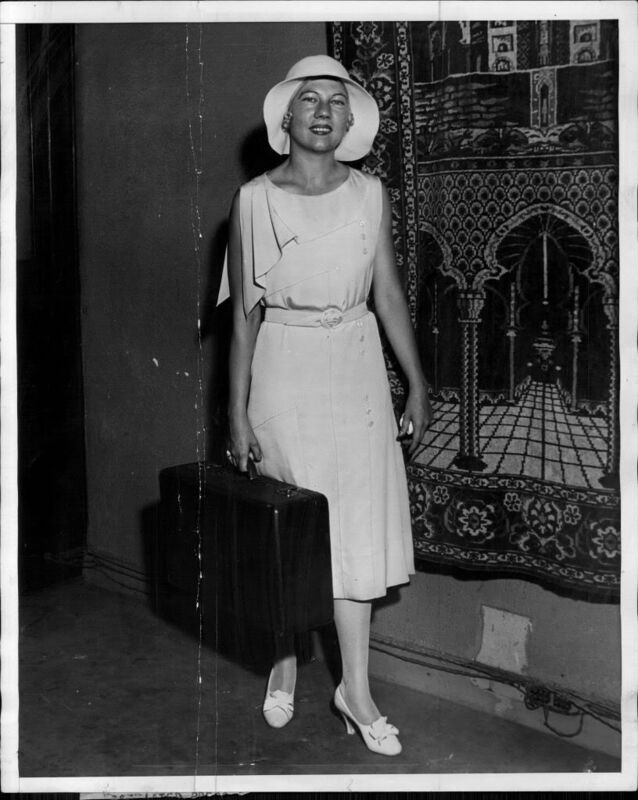 She testified that in August 1958 Ma had asked her if she would “…put her (Olga) out of the way becasue she was interferring with Frank’s future”. 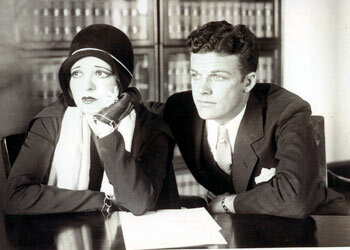 Ma told Reed that she had plenty of acid and anything else that might be needed to deal with Olga. Ma wanted Reed to go to Olga’s apartment and throw acid in her face! 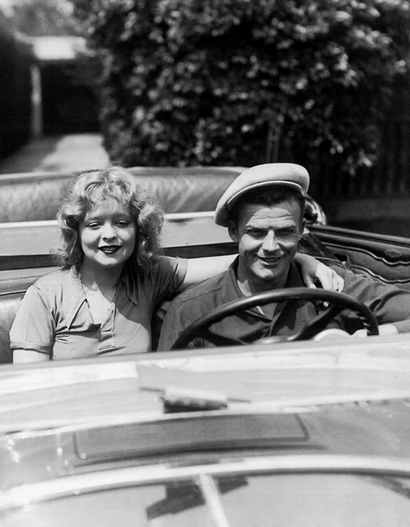 Ma said that she’d hide behind Reed and as soon as Olga had a face full of acid she’d throw a blanket over the injured woman, drag her out to the car, drive her up to the mountains and push her over a cliff! Reed was offered $1500 for her trouble. 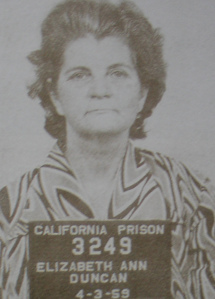 Barbara Reed said she realized that Ma had gone crazy and rather than cross her she told the older woman she’d think about the offer. 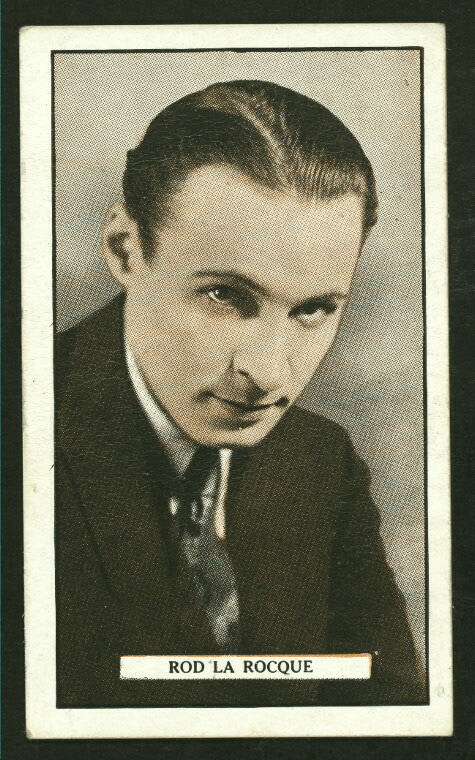 Instead Reed phoned Frank the following day and asked him to meet her at the Blue Onion. Ma had also discussed Olga with her close friend, eighty-four year old Emma Short. Short said that she had first heard of Olga Duncan after Elizabeth had taken an overdose of sleeping pills and was confined to Cottage Hospital. Short said that Elizabeth told her that after she’d recovered from the overdose Frank had promised he wouldn’t marry Olga. A woman named Diane Romero also came forward to testify to the grand jury about her conversations with Elizabeth Duncan regarding Olga. 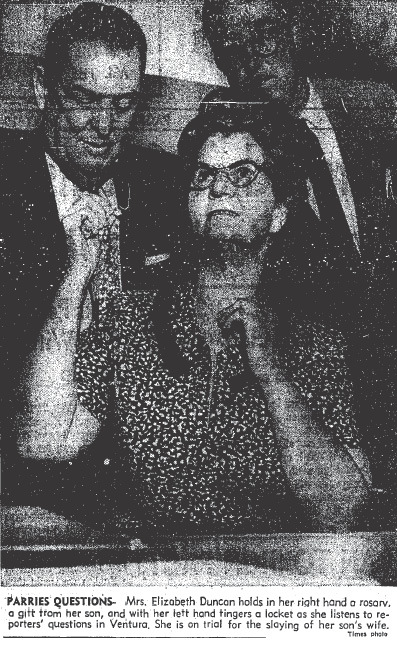 Romero had first met Elizabeth while Frank was defending her husband, Rudolph Romero, on a narcotics possession charge. Diane said that Elizabeth Duncan had mentioned her hatred for Olga and how much she wanted to get rid of her. 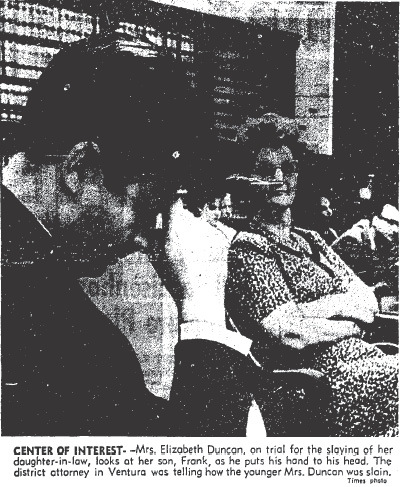 Diane’s testimony was a chilling account of the depth of Ma’s hatred for her daughter-in-law. Mrs. Romero and her husband, Rudolph, met with Elizabeth to discuss another of Ma’s plans for Olga. According to Diane, Elizabeth offered her husband money to get rid of Olga. 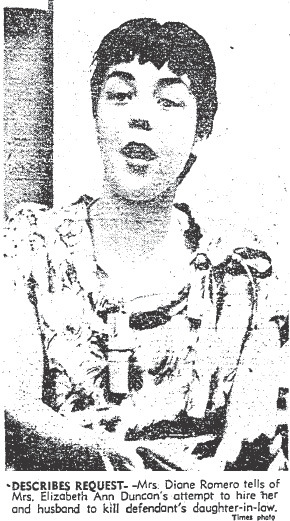 Rudolph Romero corroborated his wife’s testimony. Just in case hiring an assassin didn’t pan out, Ma had a back-up plan. She made an appointment with a local doctor and tried to get the physician’s office manger, Mary Ann Dowhower, to go out with Frank. 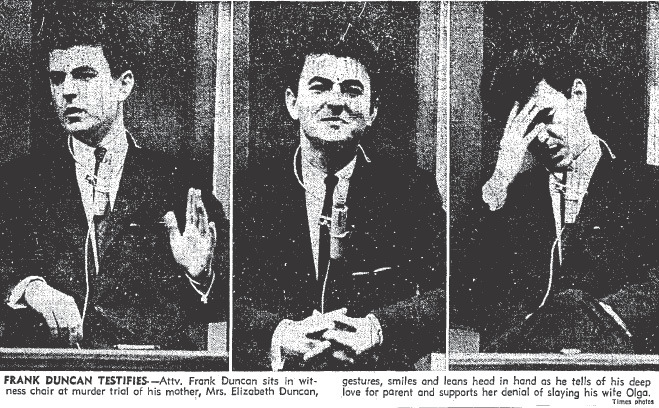 Finally, Frank Duncan took the stand and his testimony was an uncomfortable peek into the dynamic between mother and son. He revealed that his mother didn’t want him to marry at all, ever. And while Frank’s memory seemed to be very good, it failed him at some crucial moments. When he was asked if his mother had raised any objections when he began dating Olga, he stated that he didn’t recall. Frank further testified that after he married Olga, Elizabeth purchased a gun and threatened to take her own life. He took the gun from her and she promised him she would return it to the pawn shop where she had bought it. 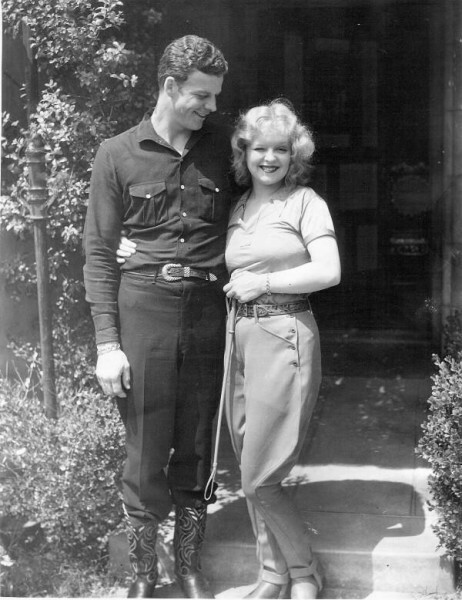 As far as Frank knew, Ma had returned the little pearl-handled .22. The horrific testimony given during the grand jury hearing resulted in the indictment of Elizabeth Duncan and her co-conspirators, Luis Moya and Gus Baldanado for the slaying of Ma’s pregnant daughter-in-law, Olga. Ma did one of the only things she could do under the circumstances — she decided to enter a plea of insanity. NEXT TIME: The trial and its aftermath. Olga Duncan accompanied Luis Moya out to the car where she expected to find her husband Frank in a drunken stupor. She thought she saw him stretched out on the backseat of the beat-up Chevy so she reached in to awaken him, and then everything went black. Luis Moya bashed Olga Duncan over the head hard enough to knock her out, and Gus Baldanado dragged her into the back seat of the car — but she was a fighter with a compelling reason to live, she was pregnant. Whenever she regained consciousness and began to scream and struggle Ma’s hjired killers beat her until she passed out. 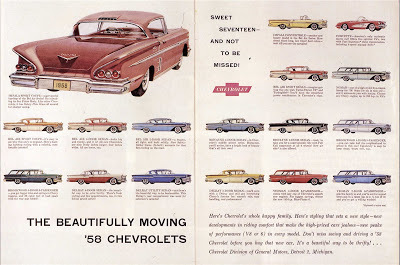 On the way out of town Luis and Gus realized that the 1948 Chevrolet they’d rented from a friend for $25 wasn’t up to a trip to Tijuana as they had originally planned. They headed south on Highway 101 and drove a little over ten miles to Carpinteria, then went another few miles to Casitas Pass Road. Gus recalled using the road to get to a winery near Ojai. By the time that they stopped they were almost seven miles into Ventura County — it was quiet, dark and deserted. Luis and Gus dragged pregnant Olga out of the car and down a small embankment. They couldn’t shoot her because they’d broken the gun over her head during one of the beatings they’d given her. Instead, they took turns strangling her until Baldanado, who had been an Army medic, decided that she was dead. The men were so pathetically inept that they had neglected to bring shovels, so they dug a shallow gave in the soft silt near a drainage ditch with their bare hands; then they buried Olga and her unborn daughter. Olga was still wearing the wedding ring that Frank had given her. 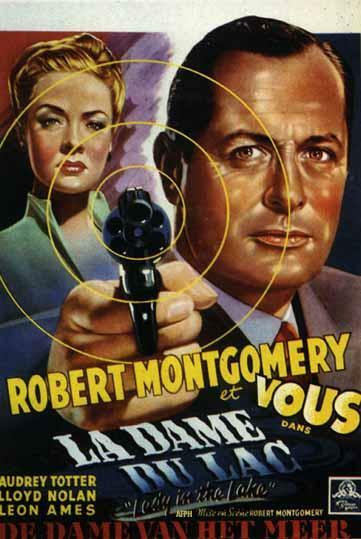 Baldanado was as lousy a medic as he was a hit man because Olga hadn’t been dead when they covered her body with dirt. The beatings hadn’t killed Olga, and neither had the attempted strangulation. She had suffocated to death. 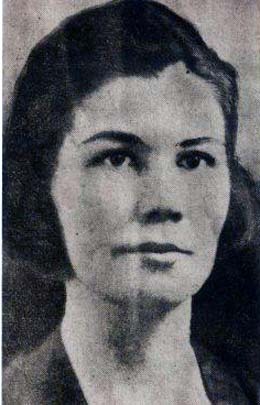 Olga had been unconscious but alive when Luis and Gus had buried her. Olga was discovered missing by a friend and colleague of hers, Adeline Curry, chief surgical nurse at St. Francis Hospital. She went to Olga’s apartment after the young nurse had failed to show up for an important operation. Curry was alarmed when she found the door to the apartment ajar. All the lights were on and the bed covers had been turned back, but the bed had not been slept in. Olga was gone. Olga’s landlady, who refused to be identified by name for fear of retribution, said she had met Mrs. Elizabeth Duncan on one occasion when she’d come by looking for Olga. 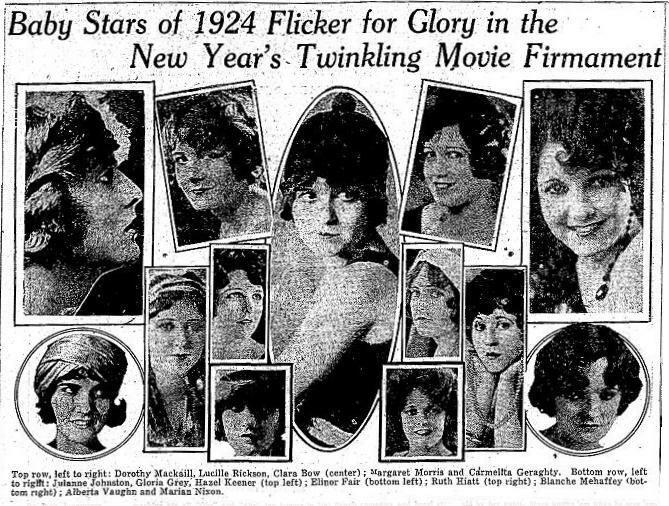 The landlady said that Elizabeth was raving and declared that she would kill Olga if it was the last thing she ever did. Then Elizabeth told that landlady that her son and Olga weren’t married at all, that they were living in sin. When the landlady challenged her, Elizabeth snapped: “All you have to do is check with Ventura. The marriage has been annulled.” The landlady told police and reporters that Olga was deathly afraid of her mother-in-law and she frequently moved to stay one step ahead of her. Upon being notified of her disappearance Olga’s father, Elias Kupczyk, turned over to Santa Barbara police letters he’d received from his missing daughter telling of Elizabeth’s constant death threats. 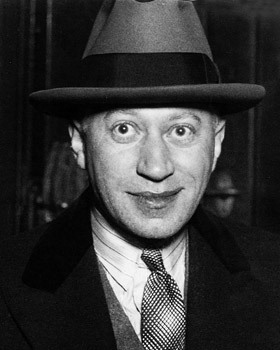 Elias was soon on his way from Canada to Santa Barbara to aid in the investigation. 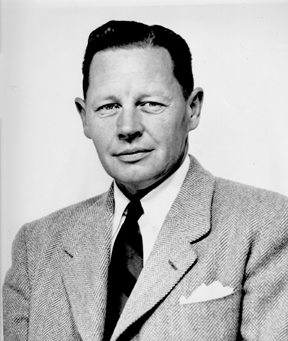 The fraudulent annulment was discovered when attorney Hal Hammons unwittingly drew up the papers for Elizabeth and a mysterious man named Ralph. Hammons had rushed the annulment through the same day as a courtesy because Elizabeth was Frank’s mother. When Hammons phoned Frank later and asked if he had represented him in annulment proceedings, Duncan told him absolutely not. Hammons contacted a Ventura District Attorney Investigator, Clarence Henderson, who began to check out the information he’d been given. The D.A.’s investigation revealed that the annulment was a fraud perpetrated by Elizabeth Ann Duncan. Ma was promptly arrested on charges of bribing a witness to influence testimony, falsifying a legal paper, forgery with intent to defraud and aiding and abetting a “Ralph Roe” in making false statements under oath. While Ma Duncan was facing charges related to the fraud two men, Augustine Baldanado and Luis Moya, were arrested . Police refused to say if the men were part of the inquiry into Olga’s disappearance. 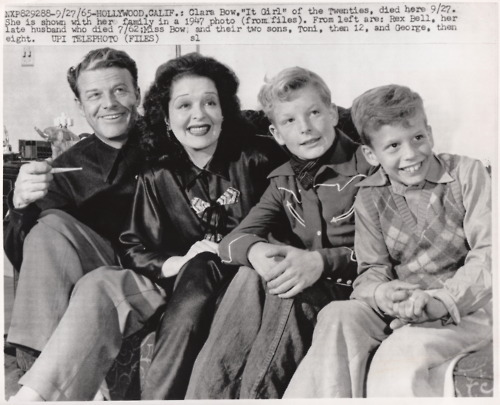 Ma appeared in court represented by her dutiful son, Frank — in fact the two walked in together hand-in-hand. Frank successfully won Elizabeth a reduction in bail from $50,000 to $5,000. He argued that the Santa Barbara and Ventura County authorities needed to “put up or shut up” with their insinuations that his mother had anything to do with the mysterious disappearance of his wife. Ma refused to comment on any phase of the case on the advice of her attorney/son. Frank had no insight into why Elizabeth had taken the drastic measure of faking an annulment, and he refused to make any comment. 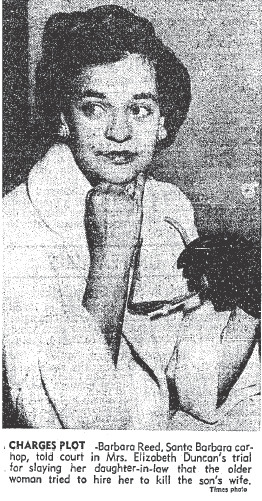 On December 19, 1958, Mrs. Elizabeth Ann “Ma” Duncan was formally accused of hiring Augustine Baldonado and Luis Moya, for $3000, to murder her daughter-in-law. NEXT TIME: Frank Duncan goes missing. Olga Duncan’s body is discovered. Elizabeth Duncan, Luis Moya and Gus Baldanado are indicted for the murder of the young bride and mother-to-be.